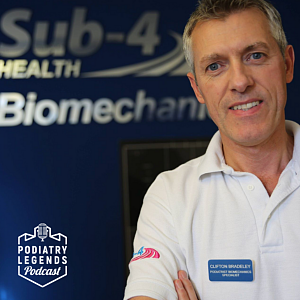 If you want to have a long and prosperous career in podiatry, you've got to love what you do each day, and my guest, UK based Podiatrist, Clifton Bradeley does exactly that. Clifton runs a podiatry business called Sub-4, but previous to this he was a world-class middle-distance runner representing both England and Great Britain and in 1985 he was the first person to run the mile in under 4 mins, indoors on English soil. His time was 3:57:88, and he was on track to compete at the 1988 Olympics until his career came to an end due to injury, but it's this injury that steered Clifton towards a podiatry career. 1:30 - The importance of listening: If you give yourself time to listen to someone else's story you'll learn that everybody has something interesting to say. 2:45 - His biggest career mistake that cost him 150,000 pounds, but also taught him some valuable lessons. "Never be afraid to pull the plug and say, it failed". 5:25 - Benefits of closing a business when it's failing. When you have a few consecutive years of success, when you're in the flow, or on a roll, you think you're indestructible, and this is when you need to keep your ego in check. "If anyone says to you there are successful all the time they are lying". 7:00 - Why failure can be a good and bad thing. Everything cannot be successful all of the time, it's part of life. If you've got a product or service in the right area that people need and want, and you have the business systems in place and you're the right person for the job, you will succeed. But if you're backing a donkey it doesn't matter how good you are; you will fail. You need to know how to identify the donkey and do it early. 11:35 - The benefits of a customer-focused business. 13:20 - SUB-4: The brand itself is everything, we protect the brand, and we promote the brand. Each year we spend money on exhibition space to promote the SUB-4 brand and business. This year we'll spend 10,000 pounds, but in previous years we have spent more than 100,000 pounds. 22:30 - How his athletic career has helped his business success. It's all about dedication. 28:30 - Flying to new New York City for Podiatry Treatment. Even though his first pair of orthotics were completely wrong and caused more problems, it did lead to an interest in the biomechanical assessment process and his interest in podiatry. Once his career began, and after talking to a few runners as patients, it didn't take Clifton long to find his home and where he felt most comfortable in podiatry. Clifton quickly worked out he spoke their language, and it's important to be passionate about what you're doing every day. You're going to get bored if you're not challenging yourself to be better. As human beings curiosity drives us, and if you're doing the same thing every day and have no passion for improving, life and work will be boring. 34:30 - Being honest with patients when you're not sure what is causing their problem. "Be honest with patients, they're not stupid, and they deserve respect". 37:25 - Aim to get control of your resources. Have a goal to buy your building and set up your lab. The more resources you control, the more power you have over your future. 38:30 - An excellent question to ask yourself is, What's Next? Before you end one project, you should already be preparing for his next step. 39:05 - Money will come if you keep reinvesting back into your business. What type of business do you want to have? Do you want a lifestyle business where you work as a solo practitioner, or do you want a company where you employ others and possibly have multiple locations? Being a solo practitioner has its benefits, and your goal should be to keep your expenses low. The fewer costs you have, the more money you save. A company, on the other hand, you need to pay yourself a set salary, and for the next few years, you need to reinvest the rest. If you set up your business with a company mindset you've got to be continually progressing and growing, however, a lifestyle business can stay static much longer, but you also don't make money when you have holidays. You can also email Clifton Bradeley directly at email/clifton)(sub-4.co.uk and visit his website Sub-4. If you want to spend the day with me learning more about marketing and How To Apply The Six Pillars of Marketing To Grow Your Podiatry Business you need to visit the OSGO WEBSITE to get your tickets. If you enjoyed this podcast, it would put a big smile on my face if you left a review on iTunes or your favourite podcast platform.